CLEVELAND – The Cleveland Foundation today honored Steven D. Standley, chief administrative officer for University Hospitals of Cleveland, with its 2014 Homer C. Wadsworth Award. The award is given annually to a local leader who has demonstrated creativity, innovation, ingenuity, risk-taking and good humor in a civic, volunteer, nonprofit or public sector role. Standley received the award at the Cleveland Foundation’s centennial meeting at Playhouse Square, presented by KeyBank. 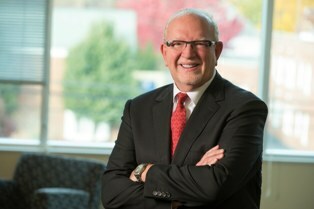 Since 2000, Standley has served in senior leadership roles at University Hospitals, including his current position as chief administrative officer. Through his innovative leadership, he has implemented workforce improvement programs which have offered residents of the surrounding urban neighborhoods the opportunity to connect to health care careers. Active in the community, Standley is the founding and current board chair for Evergreen Cooperatives Corporation, a network of employee-owned businesses in the urban core that include a commercial laundry, greenhouse and energy services company. Since 2006, he has been a member of the Greater University Circle Initiative Leadership Committee, which is focused on revitalizing large parts of Greater University Circle. Additionally, Standley supported the launch and growth of NewBridge Center for Arts and Technology, which provides opportunities for youth and adults to build careers in the arts and health care. He also has served on several community development committees including the Mayor’s Sustainable Cleveland 2019 Stewardship Council, Health-Tech Corridor Steering Committee, Opportunity Corridor Coordinating Committee and Greater Cleveland Partnership Construction Diversity and Inclusion Committee.